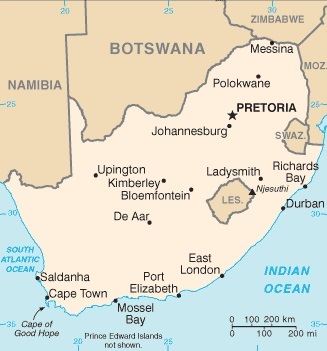 The Republic of South Africa (Afrikaans: Republiek van Suid-Afrika) is a country located at the southern tip of the African continent. It shares borders with Botswana, Lesotho, Mozambique, Namibia, Swaziland, Zimbabwe, and in the case of Lesotho, completes encloses it as an enclave surrounded by South African territory. 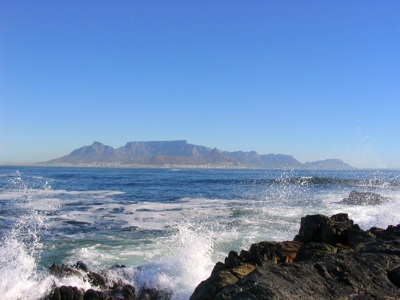 South Africa's coastline stretches across three sides (West, South, and East) of the country, and borders the Atlantic Ocean and Indian Ocean. 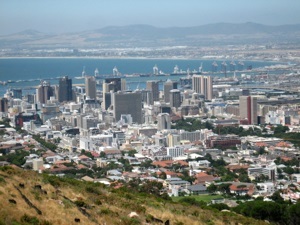 As of 2009, South Africa had an estimated population of 47,432,000. Because of the diversity of its population, South Africa has been called the "Rainbow Nation" - a phrase by coined by Archbishop Desmond Tutu, but later adopted and popularized by President Nelson Mandela.